It excites me sooooo much, to wake up, look outside, and find a sunny day out there! Mr. Renogy, our Team's 100 watt solar panel, gets excited too! Because he knows that with sunny days, he is so very close to having a fully charged House Battery. Speaking about Mr. Renogy. Did you know that he is going to be mounted up on Tránsito's solar panel rack today? Yesterday we added a 1/2" plywood base to the solar rack. With this plywood base, it's now very easy to secure Mr. Renogy up there. We have not decided if a plywood base design will be permanent. A base constructed of aluminum angle may be better. And not subject to deterioration because of rain exposure. We know for sure, that living in Scampy is very comfortable. However, why that is so, has escaped us! Yesterday, we were sitting on Scampy's bench seat. The one with a view looking out the front door. That's when we noticed that the step down to the ground is only a very short distance. Only 10". We do not know why we feel so good about that. But we do! ➜ Kitchen. Perfect size. Easy to keep clean. ➜ A big bed with firm mattress/cushions. ➜ Sooooo much cabinet space! On the Scampy RV Team, it is essential to be very organized. Things must be put away in their proper place. Or chaos reins! For the past week, we have had a tank in the middle of Tránsito's storage area. This is the grey water tank which is awaiting installation. It's like an elephant in the room! There is only so much tidying up one can do with a tank in the middle! PS: We are awaiting the grey water inlet fitting to arrive from Scamp Trailer, in order to make an appointment with AJ's Auto Service for installing that tank. Here is a scene that you may rarely view. A Renogy Solar Suitcase mounted on a roof! Don't you just love the mint green? From now on, whenever it is sunny, Scampy's House Battery will be getting charged! George, you were thinking about buying a large solar panel to install on the roof. Are you still planning on this? Yes! The large solar panel is on its way. When it arrives, I'll replace the Renogy now on the roof rack. Hot Chocolate at breakfast? I like your style Sir! 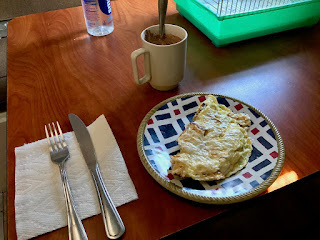 I've found out one very important thing about an RVing breakfast. I gotta take time to do it right. Yes! You are sooooo right! Scampy is definitely a perfect little home! I did not mention this in my Blog, but the matzoh eggs and onions was also an omelette with cheese in the middle! My case has awhile more to go. Once you go solar there's no going back. The freedom it allows. Wow! Yes! I agree sooooo much! charge house battery even in the dead of winter! The solar rack's side rails are secured into Tránsito's roof with four large bolts. So, the side rails are not going anywhere. What I need to do is, tie those side rails into two additional cross rails. Then tie all four rails into the large solar panel that is arriving soon. The green plywood that is up there now is only temporary. George, I know there are different types of solar panels.What type is RENOGY? I have 3 each 15 watt panels on my boat dock that provide power to the 2 , 6 volt golf cart batteries we use for power storage. 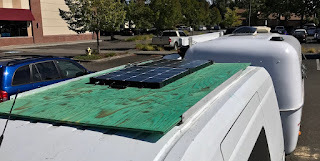 It looks like your solar panel is about the same size as the 3 panels I have. Care to share some insights on the best solar panels to consider? The Renogy is (2) 50 watt solar panels. The Yingli solar panel that I bought is poly-crystalline. Well! I didn't wish to go an entire day without even one single comment! George, I certainly like checking on you often. The scammer thing made me apprehensive about posting since I probably don't have a profile. I'm not real techie. I have that scamming nonsense under control. Please be assured that I am no longer concerned whether commenters have a profile or not. The thing that is important to me is the CONTENT of your comment. Thank you sooooo much Vera! I'm commenting on your lack of comments George. And I am commenting on your comment about my lack of comments. I actually made a comment earlier, wonder where it is? Something went awry with my Blogger comment option. There were a bunch of comments awaiting my approval. I thought that comments would be published without my approval. Just a mix-up! This is my third comment! I found your three comments in my "Awaiting Approval" section. Just a mix-up. George, Just checking in. Been following all along but the other folks say what I have wanted to say already.. Love your projects. Like I said (and you have said) its a way of life.